THE GREAT RECESSION has driven both public and private health plan sponsors to explore innovations in health care delivery that drive better value from their health care investments—better health, better care, and better costs (Dentzer, 2012; Grumbach & Grundy, 2010; US Department of Health and Human Services, 2011). Research comparing variations in care delivery models among nations, states, and regions has shown that health systems built on a solid foundation of primary care deliver more effective, efficient, and equitable care than systems that fail to invest adequately in primary care (Grumbach et al., 2009; Reid et al., 2010). Only about 5% to 6% of total medical spend in the United States is devoted to primary care. A variety of monikers are used to identify continuity primary care systems including patientcentered primary care, patient-centered medical homes, medical neighborhoods, teambased primary care, and health homes. Recent estimates indicate that doubling the proportion devoted to primary care would result in net savings and improved health outcomes (Phillips & Bazemore, 2010). But the long cycle times to prove results, small (typically < 10%) increments in primary care payments, and almost exclusive focus on redesigning doctor practices rather than engaging patients have contributed to slow adoption of advanced health home principles by rank and file health care providers (Steele et al., 2010). With the advent of health care reform and the Affordable Care Act in America, about half of practicing office-based US physicians, especially specialists, are now employed by hospitals or integrated delivery systems, a trend fueled by the intended creations of accountable care organizations and the prospect of more risk-sharing payment approaches (Kane, 2001, 2009). However, hospitals lose money when purchasing primary care practices. It is difficult to predict whether this cycle of hospitals acquiring physician practices will be any more sustainable than the 1990s when hospitals subsequently divested themselves (Kocher & Sahni, 2011). Large National Committee for Quality Assurance–recognized level III medical home primary care clinics mostly serving one common Minnesota insurer reported only slow marginal improvements in quality and patient satisfaction over a 3-year period (Solberg et al., 2011). With few notable exceptions (Bodenheimer, 2011), smallandmedium- sized physician practices use few patient-centered health home processes (Rittenhouse et al., 2011). Care delivery redesign of patient-centered primary care health homes includes offering ready access to coordinated care, longterm continuing relationships with health care providers, connected care (real-time access to prior patient clinical information at the point of care), and a payment system that rewards these activities (American Academy of Family Physicians, 2007). But patient engagement is equally important. Doctors advise; patients decide. Most patient health decisions are made between doctor visits. It is necessary to engage patients in better understanding and self-management of their conditions and treatments. Previous studies have evaluated the net benefits to care outcomes of deploying individual value-based benefit redesign or patientcentered office practice redesign (Averill et al., 2011; Coulter, 2012; Eckel, 2008; Ettner, 1999; Finkelstein et al., 2012; Gibson et al., 2011; Rollnick et al., 1999; Rosenthal, 2008; Saultz & Lochner, 2005; Smerd, 2010; Sokol et al., 2005; Zastrow, 2010). This prospective cohort study of adult beneficiaries of a self-insured employer health plan compares outcomes of preintervention standard preferred provider organization (PPO) plan coverage with outcomes of postintervention health home benefit plan coverage offering value-based benefit redesign, office practice redesign, mutual engagement of physicians and patients in shared care plans, strong incentives aligned with desired outcomes, information technology support, and personal health coaching. It compares total medical costs, health improvement, and satisfaction levels between a baseline year of coverage by a standard PPO plan and the first 2 years of coverage by a health home benefit plan offering faster access and continuing personalized care with strong behavior change incentives and support services for doctors in small practices and their patients. The participating self-insured employer offered standard PPO and health home network benefit coverage for adult beneficiaries regardless of illness burden beginning January 2010. The plan sponsor is a large employer with 558 employees and 449 adult and child dependents in Las Vegas. Of the 1007 eligible Las Vegas–domiciled beneficiaries of the self-insured employer health plan, about 74% were employees and adult dependents (the 745 who were eligible for the Preferred- Care Plan) and 26% were dependent children younger than 18 years. Neither children younger than 18 years nor employees of the company or their dependents residing outside Las Vegas were eligible for the pilot health home network benefit plan that was only deployed in Las Vegas. The employer specializes in publishing, software, real estate, and call center services. Illness burdens of beneficiaries reflected in historical health risk assessments and biometric testswere consistent with other local service industryworkers. The employer leadership had a long-established record of implementing a health-promoting culture in the workplace. The aging workforce, high medical cost trends (10%+ increase per year the prior 3 years), and serious economic recession motivated them to seek more active engagement of their members and health care providers in improving the health status of the plan members and lowering medical cost trends to maintain affordability of health insurance coverage. Members could choose enrollment in the patient-centered health home network benefit plan with richer coverage and service levels, higher member self-management responsibilities, and smaller primary care physician (PCP) network or the standard PPO plan offering more freedom of choice with substantially higher out-of-pocket expense. Upon enrollment in January of each year, members who chose the PreferredCare Plan were offered multiple face-to-face contacts and printed explanations of the benefits and member expectations detailed in Table 1 at the employer worksites, in PCP offices, and through mail and telephone calls from the program administration staff. The 5 steps of PreferredCare Plan participation included (a) designate your health home PCP from 8 offered; (b) complete the health risk assessment and biometric testing with your PCP within the first 90 days of enrollment; (c) access primary care through your PCP; (d) follow care guidelines recommended by your PCP; and (e) provide personal experience feedback on the Preferred- Care Plan. When you need nonemergency health care services during normal business hours, contact your health home directly on the dedicated PreferredCare Plan telephone line at your PCP office. If you require a specialist, contact your health home and it will coordinate the appointment. If you require urgent care after hours or emergency care, contact your health home within 72 hours of the visit for follow-up. If your health home PCP refers you to the PreferredCare Plan Health Management Program, call the registered nurse health coach and follow the recommended care plans approved by you and your health home PCP. To coordinate your care when you require specialty care, contact your health home PCP and obtain a referral explaining the assistance requested and Specialist Coordination Form to complete and return to your PCP detailing the results of your specialist visit. To continuously improve services, we will contact you to provide program executives feedback on your experience with the PreferredCare Plan after each visit to your health home PCP. The contract signed by PreferredCare Plan enrollees at annual open enrollment also specified what they would receive in return for meeting their expectations. 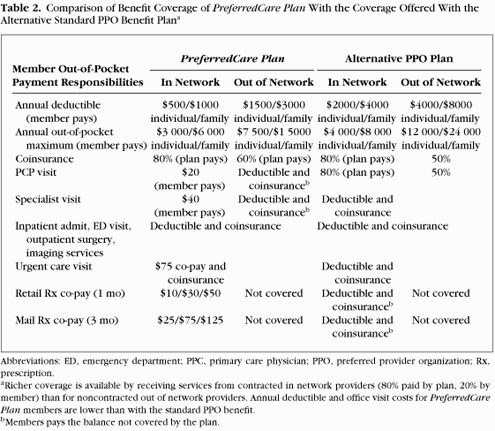 For following expectations of the PreferredCare Plan, the enrollees received (a) concierge-level primary care services by their health home PCP; (b) same-day access for acute care needs if the office was called before 10 AM; (c) dedicated phone line at the health home PCP office only for PreferredCare Plan members for rapid answers and advice; (d) less than 60-minute turnaround time from entering the doctor office to exiting the office visit (unless longer evaluation is desired for complex needs); and (e) much lower out-of-pocket expense for copays, deductibles, and premium contributions (Table 2). If an enrollee failed to comply with one of the expectations (Table 1), a letter was mailed to the member explaining the observed discrepancy, offering the member the opportunity to demonstrate that the alleged discrepancy was an error. The appeal process was consistent with Employee Retirement Income Security Act, Department of Labor, and other relevant Federal and State statutes and regulations. If the review of the appeal determined that the discrepancy was upheld, the member received a reminder of the expectations and a warning letter that a second nonadherence event would result in financial penalty. If the second noncompliance event was established as valid after appeal and review, the member’s financial responsibility for its premium contribution increased at the beginning of the following month. If a third violation was validated, the member was disenrolled from PreferredCare and automatically enrolled in the more costly standard freedom of choice PPO plan. The actuarial difference in out-ofpocket costs to enrollees was 30% higher for enrollees in the standard PPO plan through a combination of increased premium contributions, deductibles, and co-pays. Primary care physicians recruited to participate in the health home benefit plan were previously screened on the basis of patterns of high-quality and efficient care and popularity among employees and spouses who were beneficiaries of the employer’s benefit plans. They signed contracts with the employer that defined the quality, access, satisfaction, and cost-savings performance expectations to qualify for significant performance bonus payments. The health home PCPs agreed to accept single, more generous global payments covering all services for each member’s office visit, using a single procedure code that replaced the lower average payments from the usual multiple fee-for-service codes for office care of standard PPO plans. For PreferredCare Plan members, physician offices agreed to register their findings and recommendations on the program’s Web-based patient registry within 3 business days. Participating PCPs encouraged patientswithout established specialist relationships to seek care from specialists with efficient and effective care patterns demonstrated in medical claims and patient registry records of coordinating care with the PCP. Since the plan was a PPO plan, members with established relationships with specialists could continue to see in plan specialists they were using before the implementation of PreferredCare. Network specialists and facilities were compensated through discounted fee for service payments. The resulting medical and pharmacy claims were monitored and evaluated for possible improvement opportunities in conjunction with the attending health home PCPs. 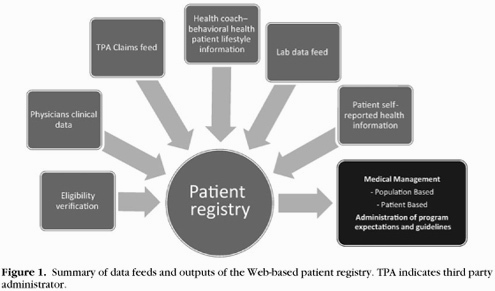 The proprietary patient registry accepted data feeds from eligibility verification, physician clinical information entries, third party pharmacy and medical claims, the health coach care tracking information system, laboratory test data feeds, and patient self-reported information from health risk appraisals, health coach interactions, and satisfaction surveys (Figure 1). Health home PCPs were provided periodic reports from the program’s claims data warehouse and patient registry showing observed versus expected levels of patients’ adherence to their recommendations, total medical costs with drilldowns by cost type, satisfaction levels for each satisfaction survey element, and health care services their patients were receiving from other health care providers. Registered nurse health coach services and care plan progress reports were made available to health home PCPs and members to assist them with achieving the goals of shared care plans mutually developed between the PCP and the patient. Nurse health coaches tracked intake history, patient activation scores (Mosen et al., 2007), Patient Health Questionnaire-9 depression screen results (Kroenke et al., 2001), care plan deliverables, training curriculum progress, and patient self-reported health metrics (blood pressure [BP], weight, activity, filled prescriptions, test results) with a Web-based health management tracking system offering bidirectional data feeds with the online patient registry. On the basis of the agreement, each enrollee was mailed a “Care Kit” that contained the needed equipment (BP cuff, scale, glucometer, etc) and simple to understand reading materials and journals relevant to the curriculum to follow during subsequent face-toface and/or telephonic encounters scheduled at the convenience of the patient (Figure 2). Regular meetings of the employer senior managers, program administrators, medical director and health coach, and PCPs identified lessons learned and assisted with designing program improvements. Global per enrollee per month payments were incurred and included in the costs of administering the program, deploying the information technology, nurse coach and medical director support, and implementing interventions based on analyses of medical cost, quality, and satisfaction data. 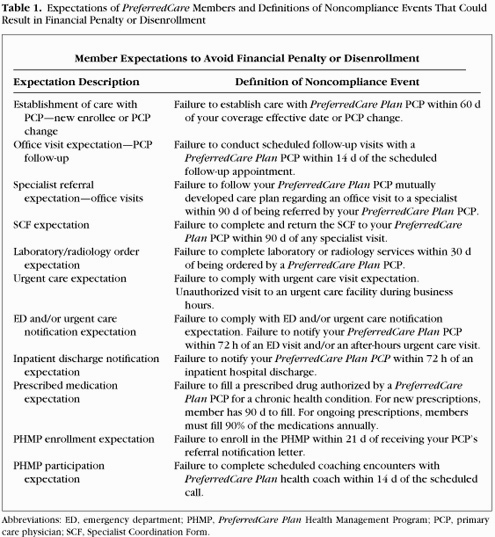 If the PCP’s PreferredCare Plan members achieved 15% total medical and pharmacy claims cost savings below their actuarial expectations (after excluding catastrophic claims above $40 000 per year) and 85% adherence to evidence-based care guidelines, and 85% patient satisfaction ratings of care and service, the health home PCP would receive an additional 50% performance bonus for each 6 months that all 3 standards were achieved.